Turn on the TV, Netflix, or go to the movies, and you’re likely to see an artistic depiction of supernatural evil. Millions are fascinated with the powers of darkness–ghosts, ESP, past lives, Eastern-style meditation (Yoga, Contemplative Prayer), and supernatural creatures such as aliens and UFOs, Bigfoot, etc. Even the Roman Catholic Church recognizes the increase in evil. In response, they have increased the number of official exorcist, and now U.S. Bishops have approved publication of an English translation of exorcist rituals. The book, “Exorcisms and Related Supplications” is now available in the United States, and “includes an appendix of prayers ‘against the powers of darkness’ that anyone can pray. In truth, you don’t need to purchase a ritual book to experience freedom from evil and supernatural entities like poltergeist and aliens. All you need is Jesus–the power of His name. His authority brings deliverance every time–if a person truly wants to be set free. Colossians 2:15: And having spoiled principalities and powers, he (Jesus) made a show of them openly, triumphing over them in it (the cross). Romans 10:13: For whosoever shall call upon the name of the Lord shall be saved (delivered). Matthew 28:18: And Jesus came and spake unto them, saying, All power (authority), is given unto me in heaven and in earth. Philippians 2: 9-11: Wherefore God also hath highly exalted him, and given him a name which is above every name: That at the name of Jesus every knee should bow, of things in heaven, and things in earth, and things under the earth; And that every tongue should confess that Jesus Christ is Lord, to the glory of God the Father. Sometimes prayer and fasting is necessary, but more often than not, a quiet whisper of the name of Jesus is all that is needed. At times I shake my head when I run into “Titled” Christians. You know what I’m talking about–Apostle this, or Prophet that. I especially find it grinding in my soul when a preacher or “evangelist” uses his position (and his flesh) to stir up a congregation so he can get more amen’s for himself. More often, I have found that God moves in very profound ways when we just worship in simplicity. Along that line, in the midst of researching something else I ran across this article called, “50 Names and Titles of Jesus” on Crosswalk.com. I challenge you to slowly read the names and titles of Jesus, you will be blessed just as I am blessed. Sometimes we need to abandon the formalities and titles and those who love to have it so, and just get back to Jesus. After all, He is the King of Kings, the Lamb of God, Light of the World, the Alpha and the Omega, and the Lion of the Tribe of Judah….. I encourage you to watch this video by pastor Michael Hoggard titled, “Armies of the Aliens,” it will bless you, not only because he preaches the word of God, but the message is spot on regarding Bible prophecy and the End-of-Days invasion of our sin-soaked planet. If the majority of the people of Earth reject Jesus Christ as King, then God is going to give them an army of beasts to rule over them. Watch this video, it is one of the best I have seen regarding aliens, UFOs, and the incredible link of the phenomena to Bible prophecy. I do not know pastor Hoggard, I have never met him, and I hope he does not mind if I share his video. I believe his message is a word for our time, and I encourage you to share this video with your friends and your Church or Sunday School. Follow along as he preaches about the “Armies of the Aliens” from the King James Bible. 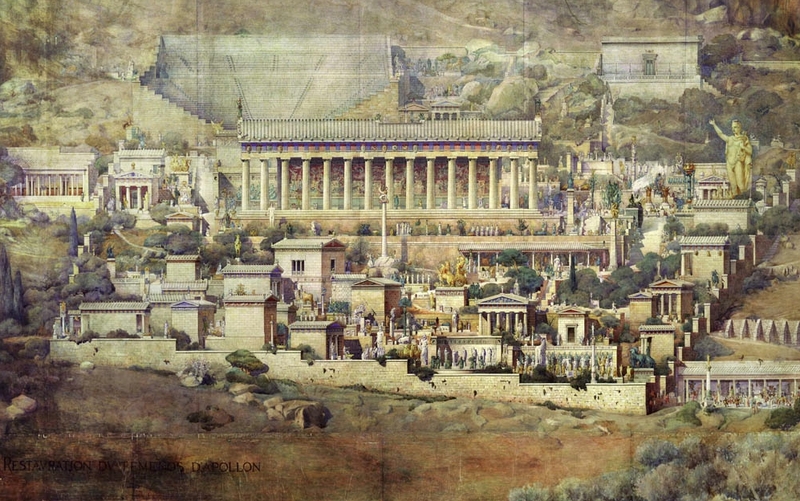 Speculative illustration of ancient Delphi by French architect Albert Tournaire, 1894. In every ancient temple is a secret chamber where the god lives and dwells. The most famous temple of the ancient world was the Oracle of Delphi, located on the southwestern slope of Mount Parnassus in ancient Greece. Deep within the temple was the inner sanctum occupied by the Pythia, a prophetess who sat on a golden tripod over a fissure in the rock floor. Seeping from the fissure, the pneuma, or breath of Apollo, would fill the chamber and possess the Sybil, causing her to go into a trance as she brought forth the word of the god. For over a thousand years, the people’s of the ancient world sought the word of Apollo as it came forth from the secret chamber of Delphi. Likewise, in our time the spirit of antichrist seeks to occupy the secret chambers of a temple as well, and in this case the secret chamber is the human body, specifically the place of the mind or soul. What is the secret chamber of the human mind? It is the secret place in the human heart and mind where sin takes place. It is the place of idolatry in the imagination center of the human heart. Jesus said, “But I say unto you, That whosoever looketh on a woman to lust after her hath committed adultery with her already in his heart. (Matt.5:28). James said, “But every man is tempted, when he is drawn away of his own lust, and enticed. Then when lust hath conceived, it bringeth forth sin: and sin, when it is finished, bringeth forth death” (James 1:14-15). All sin begins in the heart, the mind, or, we could say, in the secret chambers of the soul. If we reject biblical truth, we become a slave to the imagination center of the heart. One of the keys to understand the Image of the Beast is that idolatry and sin begin as a lustful desire in the imagination center of the human mind. This is turn creates an image in the mind through imagination. Used wisely, human imagination can create many wonderful things, but idolatry in that secret place enslaves the soul, and creates a willing subject for the Image of the Beast. As we know, Revelation 13 addresses both the Beast and the False Prophet as they set up the world for the ultimate deception. The False Prophet receives power from the Beast to create a living image so that humanity will have an internal focal point causing them to yield to the authority of the Beast and the Dragon. The Image of the Beast is not a statue or a holographic image, but a living image implanted deep within the human mind by means of the pneuma or spirit of the Beast. Just as in ancient days, the pneuma or spirit of Apollo or Apollyon (see Rev. 9:11), still seeks to speak forth his word to his sinful followers as the Image of the Beast, a spiritual manifestation in the human mind, the inner sanctum of the human heart. That is the hidden place where sin and idolatry seizes the human will. It is the imagination center of the mind, the secret chamber of the Antichrist Beast. No wonder Scripture commands us to, “Keep thy heart with all diligence; for out of it are the issues of life” (Proverbs 4:23). And (he, the False Prophet), deceiveth them that dwell on the earth by the means of those miracles which he had power to do in the sight of the beast; saying to them that dwell on the earth, that they should make an image to the beast, which had the wound by a sword, and did live. And he had power to give life unto the image of the beast, that the image of the beast should both speak, and cause that as many as would not worship the image of the beast should be killed (Revelation 13:14-15). The phrase, “that they should make” is a Greek word (Strong’s G4160 – poieō), that means, “to make, with the names of the things made, to produce, construct, form, fashion.” Is it possible that the creation of the image is through the name of the Beast, possibly like an occult mantra, as found in Eastern meditation? Verse 15 says that the False Prophet has power to make the image live by means of the pneuma or spirit, of the Beast. The word “life” is the Greek pneuma (spirit, or breath of life; wind), and is suggestive the actions of God when He created Adam. As you recall, God breathed into the nostrils of Adam the breath of life, and Adam became a living soul. This action caused Adam to live, and produced in him the image of God as well (Genesis 2:7). Likewise, Jesus breathed on the disciples and said, “Receive the Holy Spirit” (John 20:22), which is a reenactment of His actions in the Garden when He breathed life into Adam. Could it be that in mimicry of God, the False Prophet, through the power of the Beast, breathes life into an image in man, created in the imagination center of the human mind? I think so because the Bible gives us an example of this very thing. 1 Corinthians 3:16: Know ye not that ye are the temple of God, and that the Spirit of God dwelleth in you? 1 Corinthians 3:17: If any man defile the temple of God, him shall God destroy; for the temple of God is holy, which temple ye are. Do not defile the Temple of God by cavorting with demons, false prophets, or the Image of the Beast. My next post will go further into this intriguing connection.